Oswestry Sports Forum works towards the benefit of Sport and Physical Recreation in the Oswestry area and attempts to improve accessibility to Sport among the people of the area. This includes a small grants programme. The Sports Forum comprises volunteers who represent a range of member sports clubs. Oswestry Sports Forum provides a virtual place where members of the local sporting community can meet, discuss issues and share best practice - a forum for local sport. The second meeting of the Good to Great! 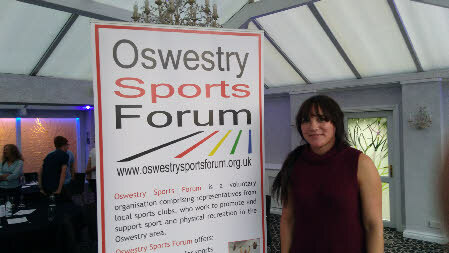 Oswestry Sports Network was held at the Lion Quays Hotel on Friday, 8th June. “Good to Great!” is a network of teenagers nominated by their club or school as potential elite athletes. Members come from a wide range of sports including rugby (boys and girls), cricket, swimming, tennis, athletics, triathlon and equestrianism but have many challenges in common. The topic for this meeting was sport psychology with guest speaker Louise Capicotto. Louise has recently retired from weight-lifting where she was Gold medallist in the European Championships. She is now sport psychologist for Leicester City FC Academy, specialising in eating disorders and youth sport psychology. She gave an interactive presentation about managing stress, the power of visualisation, relaxation techniques, different types of motivation and how to control your mind to maximise your performance. The meeting was generously sponsored by iHEAT, Oswestry-based plumbing, heating and renewable energy specialists. The next meeting will be in October, on the topic of sports nutrition. Any teenager who is doing well in their club and would like to become a member of the network should ask their coach to nominate them. Nominations should be sent to susie(at)oswestrysportsforum.org.uk . Membership of Oswestry Sports Forum is open to all organisations in the Oswestry area provided that they support and promote the objects of the Sports Forum. The Membership subscription fee is £10 per year, payable on 1 September. Membership entitles the organisation to attend meetings of the Sports Forum (e.g. Forum Evenings, the annual Sports Awards presentation evening and the AGM). Each member club has one vote at the AGM. Members who provide an email contact address will also receive updates concerning sport in the area, funding for clubs, coaching opportunities etc. Member clubs are also eligible to apply for grants on the small grants scheme (see Grant Conditions). To apply for membership, please complete the Membership Form and return it to the Secretary. We also host annual Sports Awards to recognise local sporting performance and club volunteers. We arrange Forum meetings on topics of interest to local sports men and women. During the Oswestry Games 2012, we created a Hall of Fame for local sports stars, past and present, which is on permanent display in Oswestry Leisure Centre. The closing date for the next Grants round is Monday, 16th September. Grants will be decided at a meeting on Thursday, 4th October at 7.30 pm. Applicants must attend or be represented at this meeting. Full conditions and application forms can be downloaded from the “Grants” page - see tab on left hand side of this page. The last grants round was held in July. Claudia Savage was given a contribution towards her Level 2 Swimming Teacher qualification. Matthew Collins was awarded a grant to pay for his Lifeguarding course and St Martins FC was awarded £500 towards their league fees and kit costs. The area of benefit is Oswestry plus the area within 10 miles’ radius. It includes St Martins, Ellesmere, Baschurch etc. Click on the Grants tab for how to apply. If you would like to find out more about Oswestry Sports Forum or if you have a question about Sport in Oswestry, please contact us! NB. We have avoided showing the @ in the email addresses on this site in order to avoid spam to those addresses. Good to Great! Network guest speaker , Louise Capicotto on 8th May. New members are inducted into the Oswestry Sporting Hall of Fame during the Annual Sports Awards Evening. Suggestions for new members would be welcome. Hall of Fame members are people from the Oswestry area who have achieved national importance in sport e.g. by representing their country (at Senior level, not age group) in international competition. Please see the Hall of Fame page for more information. Please see the Sports Awards page for Nomination Forms and last year’s winners.